The whitewashed paradise called Santorini is ready to be filled for one more year with athletes and their fans. “Santorini experience” and “Art of Motion” will create the ultimate sports spectacle on 6-8 October 2017. You don’t want to miss all the fun! What shall we expect then? “Santorini Experience” begins with open water swimming from the volcano to the old port of Fira. Competition will be hard as Olympic and World Champions are expected to participate. A running competition is also included in this organization, where runners compete in 5km, 10km and 15km on a path that connects Oia and Fira. If you want to feel the adrenaline pump, then you should attend Red Bull “Art of Motion” event. 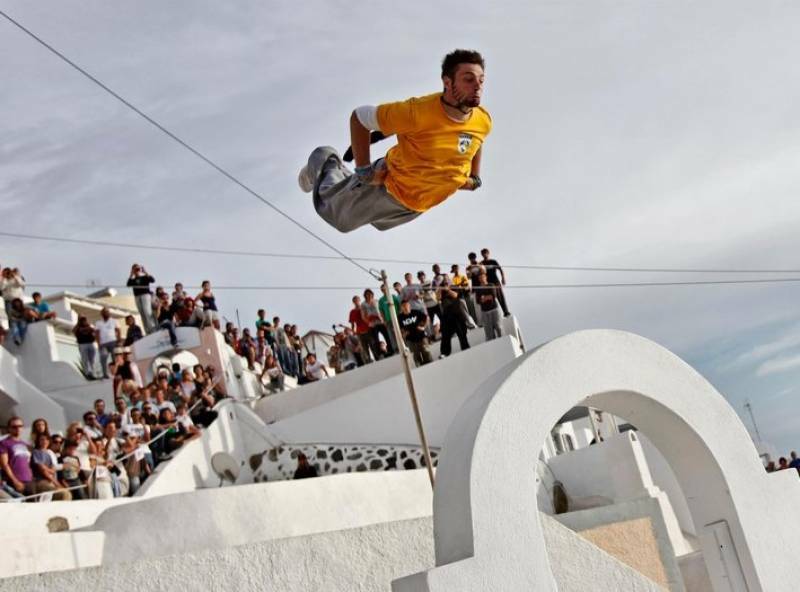 It is a freerunning competition has been taking place in Oia since 2014 and this year is no different. The event welcomes 18 freerunners from the international scene, who will compete in an unbelievable setting. The stage for the event will be the famous caldera, which has been described as “the world’s perfect playground”. So, what do you say? Book your luxury Santorini villa and enjoy the whole experience.